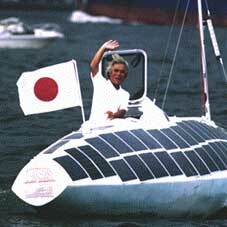 Ken-ichi Horie sailed the solar powered Malt's Mermaid across the Pacific in 1996. He sailed from Ecuador to Tokyo in 138 days, a new world record. Malt's Mermaid was mado of 22,000 recycled aluminum cans and was 31 feet long and 5.2 feet wide. Solar panels covered the deck to drive the electric motor. Horie says that he decided to make the solar-powered journey when he realized how much a solar boat has in common with yachts. The solar boat uses the gifts of nature like the sun and the wind to propel itself, just as yachts do, and it does not pollute the water or the air. 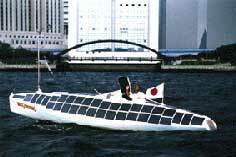 In 1993, Captain Horie set a 4,660-nautical-mile record in a human-powered pedal boat. The record, in 1996, was for the fastest Pacific crossing in a solar-powered boat, in 138 or 148 days (I've seen both stated). In 2008 Captain Horie sailed the Suntory Mermaid II, on wave power alone from Hawaii to Japan in 110 days. World record again.